Special Containment Procedures: SCP-3558 is stored in a standard Safe-class containment unit. Outside of testing purposes, it is not to be removed from its casing. Direct contact, even through layers of protective material, is insufficient to avoid its compulsion effect; all handling of SCP-3558 must therefore be done using the provided pair of forceps. All handling of SCP-3558 must take place in the presence of at least two personnel trained in the nonlethal restraint of lightly armed targets. Any individual who succumbs to SCP-3558's effect outside of approved testing parameters is to be appropriately restrained and disarmed. 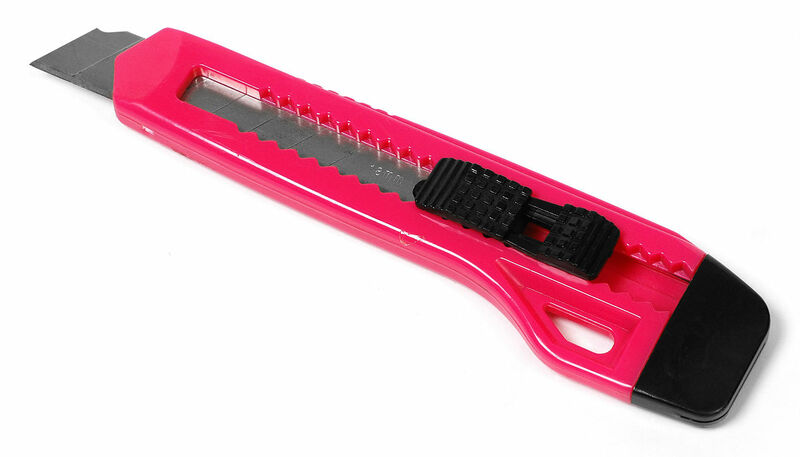 Description: SCP-3558 is a pink retractable box cutter of unknown make originally acquired by the Foundation at the ████ ███████ Preschool in Miami, Florida. When acquired, SCP-3558's handle was heavily stained with blood. When held by a human being, SCP-3558 compels them to pinch one of their eyelids with their free hand, stretching it carefully away from their eyeball. SCP-3558's wielder will then carefully slide SCP-3558's blade under the extended eyelid, taking care not to damage their eyeball. They will then perform 10-12 perforations along the upper part of their eyelid followed by a single slicing motion to excise the eyelid with minimal damage to surrounding tissue. The wielder will then repeat these actions on their other eyelid. Replacing or removing its blade entirely produces no change in SCP-3558's induced behaviour, suggesting that the effect is only limited to its handle. SCP-3558's wielders exhibit no other cognitive abnormalities aside from this compulsion effect. They will continue acting under its influence until the object is removed from their grip, or until both their eyelids have been entirely excised. The resultant lacerations of SCP-3558-affected individuals will scar over more quickly and experience lower rates of infection compared to similarly disfiguring facial injuries in other subjects. Improved night vision and mild insomnia has also been reported. Due to the lack of controlled testing1, these effects have yet to be conclusively identified as part of SCP-3558's anomalous properties. 1. Approval for such testing from the Ethics Committee has been repeatedly denied.